To obtain more information regarding the SNF PEPPER, or to access your current PEPPER if you’ve not yet done so, go to https://www.pepperresources.org/, and find “Skilled Nursing Facilities” at the bottom of the page. AHCA announced that its skilled nursing center members have lowered antipsychotic usage by nearly 30 percent nationwide. According to data from the Centers for Medicare & Medicaid Services (CMS), 16.7 percent of residents in member centers were receiving an antipsychotic medication in the third quarter of 2015 compared with 23.6 percent in the fourth quarter of 2011 — a 29.2 percent decrease. Announced at its National Quality Summit in San Antonio, Texas, the milestone represents a faster rate of reduction and a lower rate of usage than non-member skilled nursing centers, which currently show a 27 percent decrease and 17.4 percent usage rate. 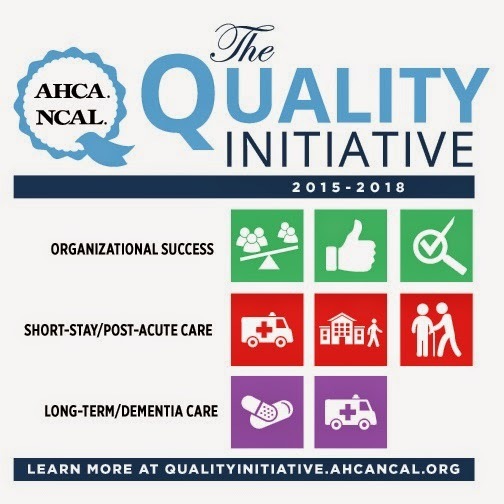 AHCA launched its metric-based Quality Initiative in 2012 and later joined CMS in supporting the National Partnership to Improve Dementia Care in Nursing Homes. In 2014, AHCA and CMS set goals to further decrease the use of antipsychotics in skilled nursing centers by a total of 30 percent by December 2016. Today, 54.6 percent of AHCA member centers have achieved the initial goal of a 25 percent reduction, while 48.9 percent have achieved the goal of a 30 percent reduction. 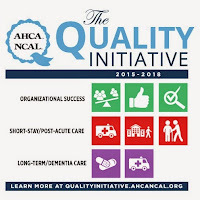 The Association expanded its Quality Initiative in May to include eight measurable targets that align with the CMS Quality Assurance/Performance Improvement (QAPI) program and federal mandates, such as Five-Star and the Improving Medicare Post-Acute Care Transformation (IMPACT) Act. Current and former leaders of CMS delivered keynote addresses at the AHCA/NCAL Quality Summit, held the second week in February. Former CMS Administrator Dr. Donald Berwick addressed sector leaders, and Dr. Patrick Conway, CMS Chief Medical Officer and Deputy Administrator for Innovation & Quality, spoke about collaboration and the innovations used to deliver quality care. If you are an Applicable Large Employer (ALE) with fewer than 250 employees and need help with your 1094 and 1095 form filings, AHCA Insurance Solutions is here to help! The 1094 and 1095 reporting requirements apply regardless of whether health coverage was offered to employees. You are an applicable large employer for calendar year 2015 if you had 50 or more full-time employees, including full-time equivalent employees, in 2014. With the extended deadlines for filing rapidly approaching, you may be able to receive these reporting services for free when working directly with AHCA Insurance Solutions. Contact us today to see if you are eligible at AHCA/NCAL Insurance Solutions or call Dave Kyllo (202-898-6312) or Nick Cianci (202-898-2841. Health Care Interactive has released a new interactive U.S. map that shows which CARES dementia training courses fulfill existing state dementia training requirements for various care settings. In states without specific training requirements for certain settings, HCI make recommendations on which training modules would be helpful for staff. AHCA/NCAL recommends the CARES training program to help safely reduce the off-label use of antipsychotics and the CARES program is also supported by CMS. All AHCA/NCAL members receive a 10% discount on the CARES programs by using the code AHCA10 when ordering. For more information, go to www.hcinteractive.com. Today, the Centers for Medicare & Medicaid Services (CMS) released the final version of a 2012 proposed rule that requires Medicare Parts A and B health care providers and suppliers to report and return overpayments by the later of the date that is "60 days after the date an overpayment was identified, or the due date of any corresponding cost report if applicable." A separate final rule was published on May 23, 2014 that addresses Medicare Parts C and D overpayments. The final rule implements Section 6402(a) of the Affordable Care Act (ACA), now also Section 1128J(d) of the Social Security Act. The provision impacted Medicare and Medicaid immediately upon implementation in March 2010. Section 6402 increased the penalty for failure to return overpayments from Medicare and Medicaid payments and mandated the timeline for returning those overpayments. Its impact solely under the statute has not been determined. CMS issued an implementing proposed rule on February 16, 2012 with comments due by April 16. AHCA's comments are available here. Section 6402 increases the penalty for failure to return overpayments from Medicare and Medicaid and mandates the timeline for returning those overpayments by providing a return deadline of 60 days after the identity of an overpayment. 60-Day Timeframe Further Defined: The 60 day timeline is a new requirement as stipulated in Section 6402. No timeline had ever before been provided. However, CMS did modify its interpretation of when the 60 day clock starts stating that "the 60-day time period begins when either the reasonable diligence is completed or on the day the person received credible information of a potential overpayment if the person failed to conduct reasonable diligence and the person in fact received an overpayment." Look-Back Period ReducedIn the proposed rule, CMS indicated a 10 year look-back period for potential overpayments. In the final rule the look-back period for overpayments is six years, reduced from 10 years in the proposed rule. Finally, as stated in the proposed rule, failure to report overpayments within the 60-day time period looking-back over six years could put providers at risk of a possible violation of the False Claims Act (FCA). View the AHCA/NCAL member guidance on the FCA. Next week, AHCA/NCAL will produce a summary of the final rule as well as a suggested checklist of 60-Day Rule activities members should undertake to avoid challenges under the final regulation. If you have questions, suggestions or concerns, please contact Mike Cheek. CMS has announced a new mandatory collection of staffing and census data, the Payroll Based Journal (PBJ). If you are not yet aware of this new CMS requirement and its survey implications, you need to be! The mandatory data submission starts on July 1st. Make sure you’re ready and know how to stay compliant. The IO Conference is offering a special session that will address all your questions: Mandatory Electronic Staffing Data Collection: Your Survey Score Depends on This. This session will review the PBJ and help you gather the necessary information. Hear what your colleagues are doing and learn the ins and outs of the mandatory data submission process. If you haven’t registered for the IO Leadership Conference, do it today. It’s a one-of-a-kind event you can’t afford to miss. 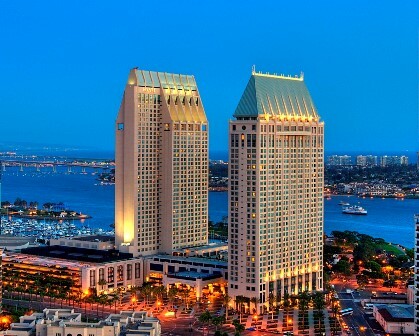 See the complete agenda, learn more, and register at io.ahcancal.org. This theme underscores the bond between staff, older adults, and individuals receiving therapies or people with developmental disabilities. Staff and residents view each other in the spirit of family. For staff, this reality is often a calling to a special mission and a life’s work. This year’s theme puts your care center square in the middle of the daily pursuit of health and happiness. What better way to promote community outreach and awareness during the week than by sponsoring a good old, street-style fair. A FunFair is a great way to create positive interactions between the residents, their extended families, including many kids who visit Grandma and Gramps, and friends or volunteers. Through the power of games, s’mores, entertainment, sing-a-longs, food, fundraiser, and much more, care centers have a platform to display the unique characteristics of your care center – and a theme to attract attention to your location at the crossroads of American generations. Look for this year Planning Guide and Product Catalog to be in your postal mailboxes in March. This year’s themed-products will help you celebrate in a classy way and your staff will like the branded products over generic knock offs. Licensed products can be ordered online. For more details on FunFair ideas, please visit the Nursing Home Week web page. Offer your ideas and comments on the week’s own Facebook page – and be sure to “friend” the page. The first incarnation of the famous tune -- It's a Small World -- was at the 1964- 1965 New York World's Fair. Back in the day it was not just a song, it represented a movement to foster peace and understanding worldwide, sparked by the 1962 Cuban missile crisis. Send schedules of activities to your local newspapers, shopping circulars and media outlets. Invite local VIPs to your events. 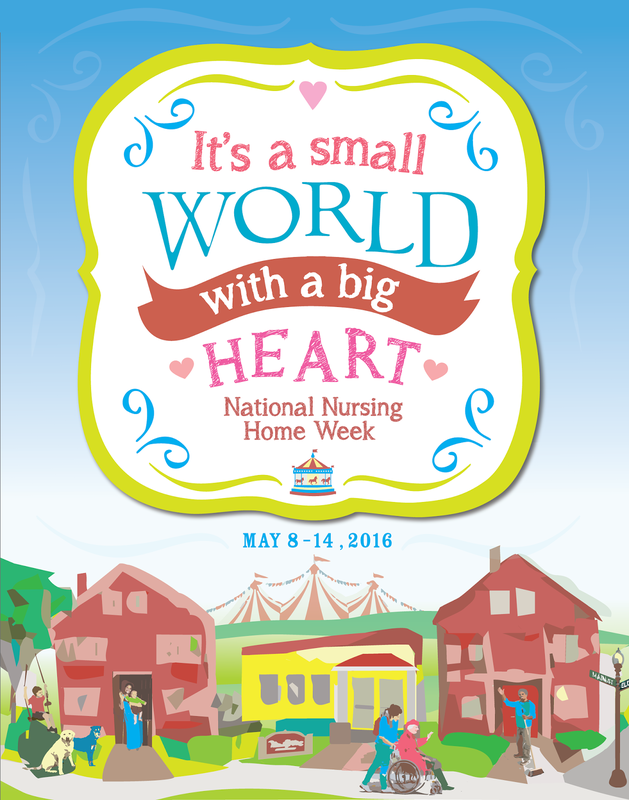 Ask the mayor to recognize Nursing Home Week and hang out banners and bunting in celebration. We’d like to hear from you on our Facebook page regarding two items about National Nursing Home Week. First, let us know if you have any suggestions for a theme for 2017. You can propose a specific theme (short) or a general topic that we can develop. 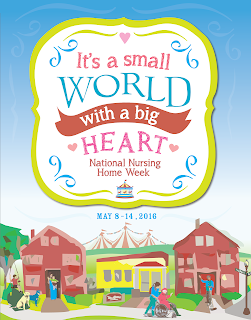 Second, after more than four decades of calling this National Nursing Home Week®, AHCA is thinking about updating the name to Skilled Nursing Care Center Week. Let us hear from you or email to tburke@ahca.org. Last week at AHCA/NCAL Quality Summit, the Building Prevention Into Every Day Practice: Framework for Successful Clinical Outcomes was released. Success in achieving positive resident/patient outcomes is even more critical now than ever before. The link between quality and payment in long term and post-acute care is growing stronger, as evidenced by the SNF Value Based Purchasing Program (VBP), Improving Post-Acute Care Transformation (IMPACT) Act, SNF Quality Reporting Program (QRP) and more. In addition, regulatory activity is intensifying and the Five-Star Rating system and Nursing Home Compare have been revised and will add items in the future as it broadens public reporting and transparency. Most importantly, consumers expect and deserve high quality care. The AHCA Clinical Practice Committee designed and built the Building Prevention Into Every Day Practice: Framework for Successful Clinical Outcomes, which outlines key elements from both an organizational and clinical nature that are critical to successful clinical and organizational outcomes. Positively, these elements reflect common denominators that cross multiple care situations. Therefore, instead of being yet another initiative or single focused project to achieve just one outcome, it is a way of acting, thinking and being that will benefit multiple areas across an organization. Applying this framework into practice will provide a strong foundation for improved resident/patient outcomes in addition to more efficient use of staff, time, and resources. Supplemental materials to support applying the framework into every day practice are posted on the website including video vignettes, worksheets, conversation starters with key takeaways and probing questions, checklists for what you can do as an individual and for what an organization can do. Embark on the journey through the Framework today! The American Health Care Association’s (AHCA) top government relations expert will participate in a live, public discussion via Twitter next week, providing insight into the association’s plans and strategy for the important 2016 election year. Clifton J. Porter, II the Senior Vice President of Government Relations for AHCA, will participate in the “Twitter Chat” on February 23, 2016 from 1:00-2:00 pm, EST. The event is being cohosted by Provider Magazine and the Bipartisan Policy Center. Providers, press, and interested parties all will have the chance to have questioned answered by one of the leading minds in post-acute care in Washington, D.C.
Porter has been the Senior Vice President of Government Relations at AHCA since 2013, and is the top legislative strategist for the association. A lifelong advocate for skilled nursing, Porter previously administered skilled nursing facilities and handled legislative affairs for AHCA member company HCR-ManorCare. Also participating in the chat is Don Redfoot of Dementia Action Alliance and Katherine Hayes, the director of health policy at the Bipartisan Policy Center. If you haven’t yet registered for the IO Leadership Conference, now is the time. Take advantage of the savings and register today. The deadline is fast approaching! When you register for the IO Leadership Conference, you’ll be joining your peers in a unique atmosphere that allows you to focus on the challenges that IOs understand and face every day. Earn 13 CEUs as you take part in a variety of education sessions you won’t find anywhere else. You’ll also hear from terrific speakers, enjoy relaxing and fun networking events, and gain strategies for improving the quality of care you provide. Lindsey Pollak, a leading expert on effectively training and managing the millennial generation, will give the Opening Keynote. Dr. Natalie Stavas will give the Closing Keynote and offer insight on the importance of altruism as well provide strategies for conquering fear and finding meaning in a chaotic world. Joanne Smikle will facilitate the Owner to Owner Town Hall. Numerous other speakers and panelists will also be there for two full days of inspiring and engaging sessions. "Whether you are a repeat attendee or first time attendee, the value of this conference with fellow IOs is priceless!" The early registration deadline is February 17, 2016. AHCA/NCAL is requesting observation stays stories from your state to be shared on Capitol Hill for its advocacy efforts. In order for us to use your story, we must have a signed consent form from the patient/former patient, which is located here. We must have the consent form when you submit your story. The stories must be brief and concise as Hill staff will not have time to read anything longer. Please add the first name, state and city on the story and send both the consent form and story to AHCA’s Dana Halvorson and Andrea Todd at dhalvorson@ahca.org and atodd@ahca.org by this Monday, February 15th. Don’t hesitate to let us know if you have any questions. More on the observation stays issue can be found on the AHCA/NCAL website, along with the updated observation stays Coalition one-pager. On January 26, 2016, the National Council on Disability (NCD) released a report entitled "The Impact of the Affordable Care Act: A 2015 Status Report." This is the second in a series of three reports that examines the provisions in the Affordable Care Act (ACA) that affect the lives of people with disabilities. To read the press release from the NCD on the report, please click here. To read about and download the first report in this series, you may do so by clicking here. President Obama Tuesday sent his $4.23 trillion budget request for fiscal year (FY) 2017 to the Hill for approval. Compared with the current budget, the request would increases outlays by $196 billion and offset them with a $308 billion increase in revenues. The White House said the budget would reduce the deficit by $2.9 trillion over 10 years while eliminated the across-the-board spending cuts known as sequestration. The budget was met with opposition from Republicans in both chambers of Congress before its full text was even released and faces an almost certain demise on the Hill. Republicans have begun crafting their budget plan but final details have not yet been released. The President’s budget includes $376 billion in health care savings, some of which affect skilled nursing facilities (SNFs). Provisions that included in previous White House budgets returned in the latest iteration. The President called for a market basket reduction for SNFs and other post-acute care providers, further reductions in Medicare bad debt reimbursement, a bundled payment program for post-acute care, and adjustment of the standard for classifying a facility as an Inpatient Rehabilitation Facility. Mike Cheek, Senior Vice President, Finance Policy and Legal Affairs for the American Health Care Association (AHCA), released a statement expressing disappointment in some of the administration’s returning proposals, including bundling and bad debt reimbursement reductions. 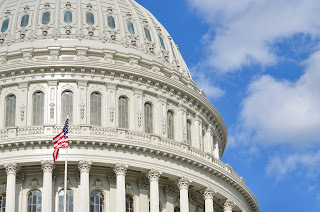 “The post-acute care bundled payment proposal in this year’s budget appears to be identical to previous legislative budget proposals. Medicare payments to post-acute care providers would suffer nearly a 3 percent reduction in only five years. This bundling proposal is merely a rate cut, not a meaningful reform of our payment and delivery system,” said Cheek. Also included in the budget is a new request for implementation of a budget-neutral value-based purchasing program before 2018. AHCA is supportive of these moves toward payment proposals that fairly award quality advancement in SNFs and looks forward to working with the administration and lawmakers as these efforts are advanced. AHCA/NCAL will continue to monitor the budget request and its myriad provisions as they are addressed and taken up by Congress. Last year, AHCA/NCAL's data collection tool LTC Trend Tracker expanded to offer features for assisted living providers. These long term care providers can now submit their staffing data to learn more about their retention and turnover trends, as well as their customer satisfaction results. More features will continue to be added in the coming year, allowing assisted living providers to track their performance on key quality indicators. A new video from AHCA/NCAL demonstrates the importance for assisted living members to use LTC Trend Tracker. The video focuses on how changing payment models put pressure on health care providers to offer better care at a lower cast, causing the formation of partnerships among health care providers. Settings like hospitals and managed care organizations are looking to work or contract with other providers that will ensure high quality care, and they want concrete evidence that other providers are equal to the task. For those assisted living providers that are already tracking their quality performance internally, LTC Trend Tracker is still a worthwhile tool. This online resource allows members to track uniform data to allow consistent measuring across assisted living, so that providers can compare themselves among their peers. LTC Trend Tracker is an exclusive, free member benefit for AHCA/NCAL members facilities. If you're a member of NCAL, and not signed up for this resource, learn how and then register through our website. Last week AHCA/NCAL submitted comments to the Centers for Medicare and Medicaid Services (CMS) measure development contractor, Acumen, LLC. In response to the Draft Specifications for the Medicare Spending Per Beneficiary – Post-Acute Care (MSPB-PAC) Resource Use Measures provided for public comment on January 13, 2016. The stated goal of this project is to develop resource use measures for PAC settings as mandated by the Improving Medicare Post-Acute Care Transformation (IMPACT) Act of 2014. These measures apply to skilled nursing facilities (SNFs), home health agencies (HHAs), long-term care hospitals (LTCHs), and inpatient rehabilitation facilities (IRFs). The stated purpose of the measures is to provide actionable, transparent information to support PAC providers’ efforts to gauge and improve the efficiency and coordination of patient care. A given PAC provider’s efficiency is evaluated relative to the efficiency of the national median PAC provider in the same setting. The objectives of the project are to 1) Produce MSPB-PAC measures that use a framework similar to the hospital MSPB measure used in the Hospital Value-Based Purchasing program, and 2) Prepare the measure for SNF, HHA, LTCH, and IRF quality reporting programs (QRPs). From a SNF perspective, the MSPB-PAC measure as proposed would use risk-adjustment to compare the total costs of care similar patients from the date of admission to the SNF, until 30 days after discharge. While there are certain costs that are being considered for exclusion, the proposed approach would permit resource use setting-specific cost comparisons (e.g. SNF-SNF). The proposed measure is not designed to compare care resource use between different PAC settings for similar patients (e.g. between SNF and IRF of hip fracture). Per the IMPACT Act, this MSPB-PAC resource use measure is to be specified, and data collection to start on October 1, 2016. This will be followed by feedback reports being provided to providers starting October 1, 2017. Finally, the law requires the public reporting of MSPB-PAC resource use measures comparing individual providers performance against a national median starting October 1, 2018. 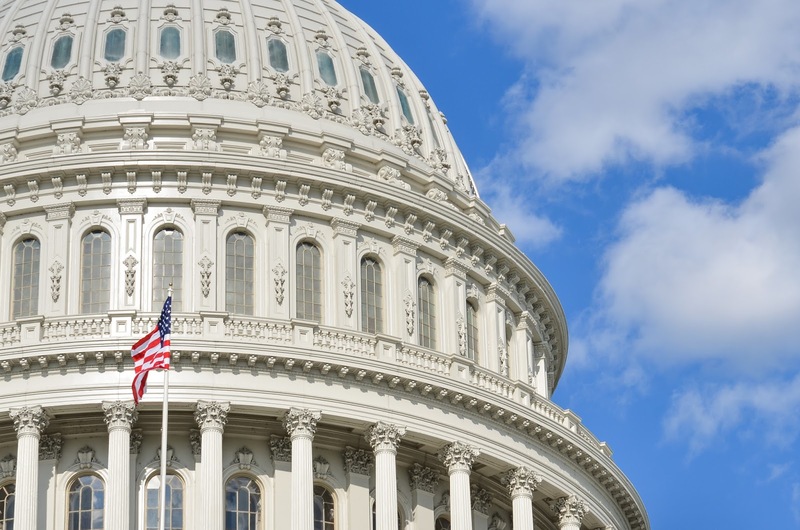 In the AHCA/NCAL submitted comments, we identified numerous concerns with the draft MSPB-PAC measure specifications, requested specific additional information, and provided recommended alternative solutions. The primary AHCA/NCAL concerns were related to 1) The alignment of the proposed measures with the IMPACT Act, 2) The lack of sufficient information and time provided to stakeholders to be able to provide informed and thoughtful comments, and 3) Inconsistencies in the draft measure specifications that confuse the terms “resource use” measures with “efficiency” measures. AHCA/NCAL members with questions or comments can contact Dan Ciolek at dciolek@ahca.org. The American Health Care Association and National Center for Assisted Living submitted comments to the Senate Finance Chronic Care Working Group. The Working Group released a series of proposals in December and called for stakeholder input. The proposals primarily call for changes targeting Medicare beneficiaries with multiple chronic conditions. AHCA/NCAL urged the group to take into account the “unintended consequences” the policies could have on current payment systems and access to care. Community-level quality metrics, for instance, could potentially put some residents at risk by taking control away from providers, the comments argue. Clifton J. Porter II, senior vice president of government relations for AHCA, said, "This issue is of vital importance to AHCA/NCAL, since a majority of the individuals our members care for have multiple chronic medical conditions — and the number is growing rapidly." Porter said that Medicare spending for beneficiaries with chronic conditions can reach $300 billion each year. Spending on beneficiaries with six or more conditions is three times higher than that of an average Medicare patient. Comments suggested that the working group distinguish between the two very different populations of patients with many chronic conditions and those with just one or two. 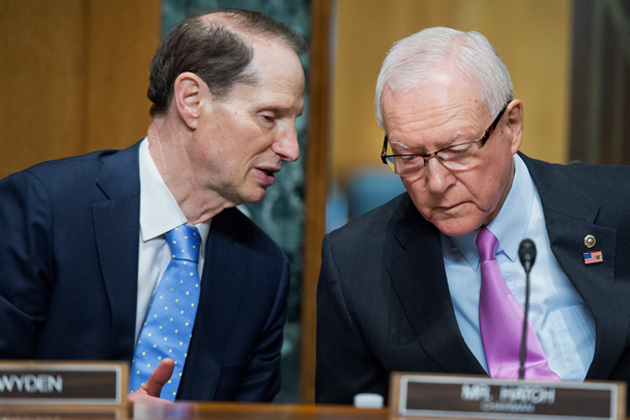 AHCA/NCAL will continue to work closely with the Working Group as the Senate Finance committee moves forward on its signature Medicare reform package. If you haven’t yet registered for the IO Leadership Conference, now is the time. 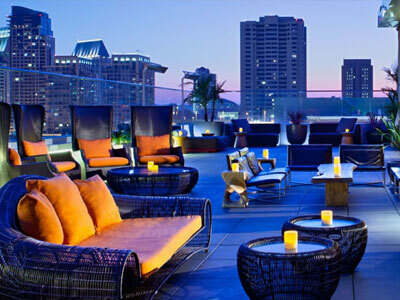 AHCA/NCAL is excited to announce that RoofTop600 at Andaz will be the sight of the Thursday dinner for all attendees. With great views, a unique atmosphere, and excellent SoCal cuisine, RoofTop600 at Andaz sets the scene for a fantastic night of networking. It’s just one of the many opportunities you will have to share ideas and connect with your peers at the IO Leadership Conference. Register today so you don’t miss out on any of the great opportunities that we are planning. Earn 11.5 CEUs, take part in education sessions geared just for you, enjoy the ever-popular Owner to Owner Town Hall Meeting, and walk away energized and inspired. So why is it, in a presidential election year that might well be boomers’ last chance to put one of their own in the White House, that so little time and space has been given to the problems (and rewards) of an aging population? That’s why Provider Magazine and the Bipartisan Policy Center are proud to announce our next #ProviderChats on Tuesday, February 23, from 1-2 p.m. EST to discuss the Politics of Aging, 2016. Clif Porter, senior vice president for government relations at the American Health Care Association/National Center for Assisted Living. His group’s constructive, “We Are The Solution” approach to lobbying has won praise from both sides of Congress and the public, helping to win victories in the long-vexing Medicare “doc fix” problem, a clean payment resolution, and passage of IMPACT. Porter has spent nearly three decades in elder care, rising from administrator-in-training to the head of HCR ManorCare’s government relations department for more than a decade. Don Redfoot, Dementia Action Alliance. Don spent nearly three decades with AARP, most recently as its senior strategic policy adviser. 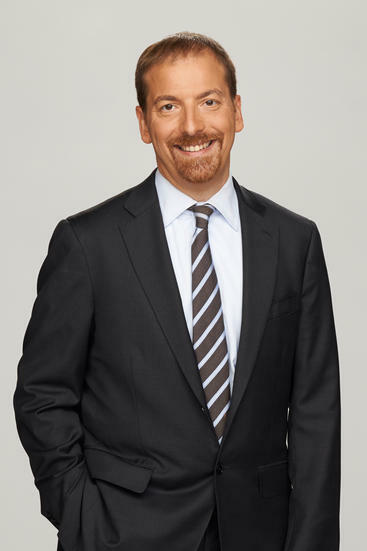 He conducted and supervised public policy research on domestic and international issues related to assisted living, long-term care financing options, and reverse mortgages. Don was a founding member and former chair of the board of the Center for Excellence in Assisted Living, and he currently sits on the board of the Pioneer Network, as well as the steering committee for the Long-Term Care Financing Collaborative. This is the month to take advantage of special sale on the AHCA/NCAL Gero Nurse Prep program. Save $100 on each training spot through February 29 by entering promo code QS2016 (all caps) when registering. Help your RNs boost their clinical competence. Check out the AHCA/NCAL Gero Nurse Prep program and try a free demo today! The Internal Revenue Service issued another reminder last week to employers about the importance of knowing the exact size of their workforce under the Affordable Care Act (ACA). This is essential because two provisions of the ACA apply only to applicable large employers – those employers with 50 or more employees in the previous calendar year. Those employers with fewer than 50 full time equivalents are not subject to the employer shared responsibility provisions and the information reporting provisions for offers of minimum essential coverage. The IRS Tax Tip contains more information for employers about calculating workforce size. AHCA/NCAL members are encouraged to check out AHCA/NCAL Insurance Solutions several months before their renewal dates before making a final decision about their employee plan coverage. Our “Members Only” program is designed to give AHCA/NCAL members access to brokers who understand long term care and who will work to save AHCA/NCAL members money. For more information, contact Dave Kyllo (202-898-6312) or Nick Cianci (202-898-2841) or email us at AHCA/NCAL Insurance Solutions. Developed through the support of the U.S. Department of Veterans Affairs, the Caring for Older Adults in Disasters (COAD) curriculum is comprised of 24 lessons in 7 modules covering topics ranging from special considerations for older adults in specific types of disasters to ethical and legal issues related to the care of the senior population during a disaster. The COAD curriculum’s lessons range from 30 to 120 minutes in length based on the particular learning context. They include suggested learning activities for educators to engage their learners, as well as required and supplemental readings for both learners and educators. The curriculum can be used in its entirety, teaching all lessons in the order provided, or trainers may select individual lessons or portions of lessons most relevant to their learners. The curriculum’s material can be adapted to best meet a specific setting and learner needs by substituting resources, modifying activities, or augmenting content. With the extended deadlines for filing getting closer, you may be able to receive these reporting services for free when working directly with AHCA Insurance Solutions. Contact us today to see if you are eligible at AHCA/NCAL Insurance Solutions or call Dave Kyllo (202-898-6312) or Nick Cianci (202-898-2841. Influenza activity is increasing across the country and the CDC has received reports of severe influenza illness. Clinicians are reminded to treat suspected influenza in high-risk outpatients, those with progressive disease, and all hospitalized patients with antiviral medications as soon as possible, regardless of negative rapid influenza diagnostic test (RIDT) results and without waiting for RT-PCR testing results. Early antiviral treatment works best, but treatment may offer benefit when started up to 4-5 days after symptom onset in hospitalized patients. Early antiviral treatment can reduce influenza morbidity and mortality. Clinicians should encourage all persons with influenza-like illness who are at high risk for influenza complications to seek care promptly to determine if treatment with influenza antiviral medications is warranted. Treatment with an appropriate neuraminidase inhibitor antiviral drugs (oral oseltamivir, inhaled zanamivir, or intravenous peramivir) is recommended as early as possible for any patient with confirmed or suspected influenza who is hospitalized; has severe, complicated, or progressive illness; or is at higher risk for influenza complications. Antiviral treatment can also be considered for suspected or confirmed influenza in previously healthy, symptomatic outpatients not at high risk on the basis of clinical judgment, especially if treatment can be initiated within 48 hours of illness onset. Clinical judgment, on the basis of the patient’s disease severity and progression, age, underlying medical conditions, likelihood of influenza, and time since onset of symptoms, is important when making antiviral treatment decisions for outpatients. Mark Your Calendars – AHCA’s 2016 ID/DD Hill Fly-In Event Right Around the Corner! AHCA’s Intellectual and Developmental Disabilities (ID/DD) Residential Services Providers annual Hill Fly-In event will occur on Tuesday, March 1, 2016, at the AHCA offices in DC. This important event is free to attend. Breakfast and a boxed lunch will be provided to registrants. Congressional speakers are being invited, a legislative update will be provided, and Hill visits will follow in the afternoon. AHCA will provide one-pagers and talking points for registrants to take to the Hill. If you would like to attend, please contact AHCA’s Senior Director of Not for Profit & Constituent Services, Dana Halvorson. If you have any question please don’t hesitate to let Dana know. AHCA hopes to see you at this important event!